CPAP stands for Continuous Positive Airway Pressure. 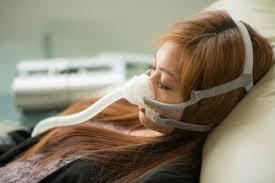 CPAP devices are the usual treatment recommended for sleep apnea. A CPAP is a small box that works by using a quiet fan, humidification chamber, and filter to create the optimal relief to nasal passages during sleep. The device delivers relief through flexible hosing and a mask. The mask is key to how successful the device is for the patient and should be well fitted and comfortable.